Sabina graduated from Eastman Dental Hospital in 1993, having previously worked as a dental nurse for six years. Sabina passed her diploma in Dental Hygiene and was awarded the Dentsply Award for Clinical Excellence. 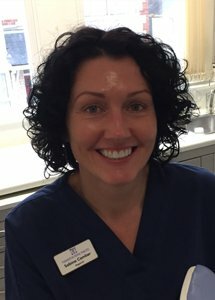 Sabina started working at Torrington Dental Practice after moving with her husband from Kent to Devon in 1998. Within her role as a dental hygienist, she works very closely with the dentists and oral health educator and is able to tailor a programme for each individual patient, focusing on prevention of gum disease and tooth decay. Sabina is a member of the British Society of Dental Hygienists and Therapists and in 2015 completed her British Dental Association radiography exams. With teenagers at home, spare time if limited but any free time is spent reading, going to concerts or walking her dog, Amos.